This week for Family Movie Night we have a special selection that any animation and Disney fan will love. This week we are talking about the recently released Walt Disney Animated Shorts Collection, which has just become available to stream on Netflix. For many people Pixar is more known for their animated shorts than Disney, so I bet many of these films will be unfamiliar to you and your family. 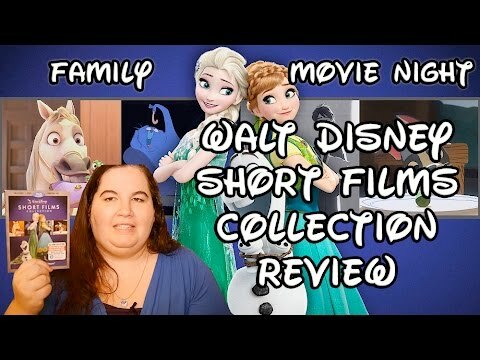 As much as I love the Pixar shorts (you can see my reviews of all the Pixar shorts on my blog at http://54disneyreviews.com/pixar-reviews/) there is something special about these Disney shorts as well. I think the biggest joy in watching this collection is the connection with the past we get. Disney of course started with shorts with Mickey and the Silly Symphonies but then we had the majesty that is Fantasia (which will be a Family Movie Night choice in a few weeks). Then during World War 2 they had a series of films known as the ‘package films’. From Saludos Amigos to The Adventures of Ichabod and Mr Toad they released 6 anthology films made up of shorts. My personal favorite is probably Ichabod and Mr Toad but I also love Melody Time and Make Mine Music has a scrappy weirdness to it I recommend. So, it is with that love for Disney and the history of shorts that I anxiously awaited this collection and it did not disappoint. With the 12 shorts included in the collection you get a little bit of everything. You have humor, nostalgia, drama, music, and get to see some of our favorite faces from television and movies. My sister took it on a road trip for her 3 girls and they loved these shorts. I think your children will love them too. John Henry– in the style of folk art tells the tale of John Henry who was so strong he practically took down a mountain to allow the railroad to go through. Great music and folksy style. Lorenzo– a story of a pompous cat who’s tail gets bewitched and he ends up doing the tango with it. It’s simple animation but still striking with tango music and some good laughs. Little Match Girl– sad but beautifully animated segment that was meant to go in another Fantasia compilation. It is dialogue free but tells the story of a girl out in the bitter cold who dreams of great things in the light of matches. Tick Tock Tale– cute story of a broken clock that is thrown away by the clock maker but he proves his worth when some thugs try to burglarize the shop. Prep and Landing: Operation Secret Santa– Your kids might recognize the Prep and Landing elves from television. They are cute and it is a nice story featuring Betty White as Mrs. Claus. Ballad of Nessie– the story of the Lochness monster but as a cute dragon who is looking for her home. Beautiful 2D animation and a sweet little story. Tangled Ever After– In this follow-up to Tangled we get to see Eugene and Rapunzel get married, which for Tangled fans like me is really fun. But the true stars of this short are Pascal and Maximus. It’s very slapsticky and enjoyable for Tangled fans. Paperman– An exciting short for animation fans because it was the introduction of hybrid animation which combines both the benefits of CG and 2D together. The story is sweet about a man trying to get a message to a woman he spots and thinks might just be the one. Get a Horse– a fun concept for a short. It starts with old Mickey style cartoon but then the cartoon pops out of the screen into CG and the CG and 2D battle back and forth between the worlds. This definitely satisfies the nostalgia bug in me! Feast– Academy award winning short tells the story of a dog and his master through the food they both eat. It is sweet and funny and everything you could want in a short. The animation looks lush with some of those hybrid details we saw in Paperman. Frozen Fever- This is similar to Tangled Ever After. It is unlikely to win over new fans to Frozen but I liked seeing the relationship of the sisters and them both trying to care for each other. I liked the song and seeing Olaf again. I also like Elsa’s new green dress. Over all, a real treat for Frozen fans! So those are the 12 shorts. I would love to hear which one you like the best. My favorites are probably Feast and Paperman; although there aren’t any that I dislike. If you get a chance to see them please put in the comments section which are your favorites and the favorites of your kids as well.